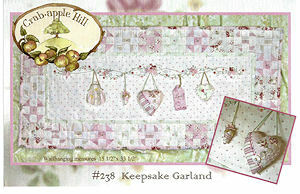 Wallhanging finishes 12-1/2" x 33-1/2"
Vintage keepsakes...memories of a special date, loved one or happy memory! They are hanging from an embroidered and embellished garland covered with embroidery, mother of pearl buttons and sparkling beads! Finish the wall hanging off with simple little shoo fly blocks!